We are pleased to offer a variety of dining options for groups and events including business dinners & presentations, rehearsal dinners, weddings, cocktail receptions, wine tastings, and everything in between! 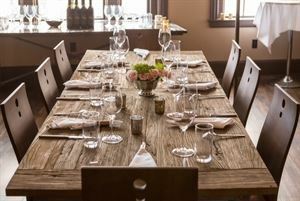 Our beautiful, fully private dining room accommodates up to 30 people seated, 50 standing. We also offer semi-private dining for up to 18 guests, and options for partial & full restaurant buyouts are available for groups of 30-75 people. Atmosphere/Decor: Beautiful, floor-to-ceiling windows overlook Congress Street & Portland's historic Arts District. Please note the private dining room is on the third floor, accessible only by stairs. There is a private restroom located on the floor. Special Features: A projection screen can be provided on request for a nominal fee. All other equipment is the responsibility of the host. Rental of the main first floor dining room and entire restaurant is available for larger functions. - The first floor dining room accommodates up to 55 guests seated. - Seating for up to 75 people total may also be possible for groups that can be seated in separate but adjoining dining areas. - Additional options/services that can be arranged with a full restaurant buyout include a separate cocktail reception area, dance floor, and whatever other customizations you may dream up! Atmosphere/Decor: Spaces for partial & full restaurant buyouts include our first floor main dining room, adjacent bar/lounge and second floor mezzanine. We will work with you to create the event you want in the location that best suits your group's needs! Along a mezzanine overlooking the main dining room & open kitchen below, our semi-private area can accommodate up to 18 guests for seated dinners. Atmosphere/Decor: Along a mezzanine overlooking the main dining room & open kitchen below, our semi-private area can accommodate up to 18 guests for seated dinners. This space is located on our second floor of dining, and is accessible by stairs only. Atmosphere/Decor: Warm atmosphere with copper sheets along the walls and drink nooks on the second floor. Open kitchen, shining like a starched and gleaming world of stainless steel and flame among the soft earth-tones of the tables and chairs. Special Features: Offering fine wines, desserts and cheeses. The appetizers and salads are all very very good. The truffled lobster “mac & cheese” is absolutely fantastic. The huntsman’s burger is served on a house-made blue cheese biscuit - an incredible burger. The best burger I've ever had. The salmon is cooked to perfection all the time. The service and staff are impeccable. Consistently great dining! At Bruno’s, we understand that the only thing better than getting together for a special occasion is having the perfect meal to go along with it. Join us or we’ll bring it to you! Bruno’s offers homemade, traditional Italian American cooking at a price that you’ll enjoy as much as our menu offerings.